In everyday life we measure all sorts of things! Practice measuring length in centimeters with this colorful worksheet. Kids will use the "centimeter" ruler guides provided on the worksheet to practice making measurements of length. 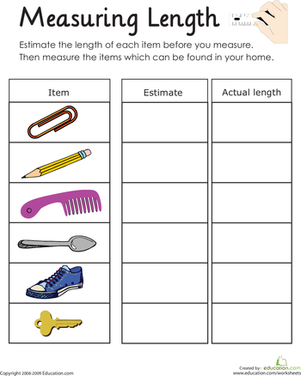 Help your child practice his skills in measuring with this printable worksheet, which asks him to measure the length of household objects. Challenge your first grader to estimate each fish's length before he measures. Get your students measuring and moving as they measure different objects around the room with centimeter cubes and record their findings. 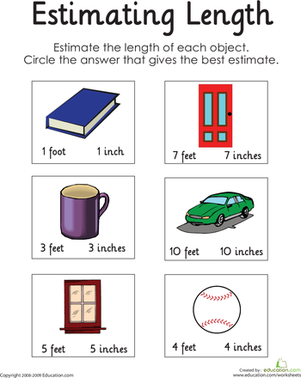 Help your child practice his skills in estimation with this printable worksheet, which asks him to assess the length of household objects.